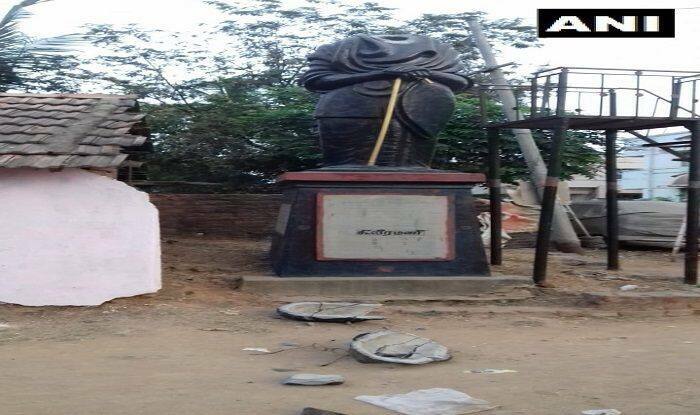 Periyar's statue was on Monday vandalised in Tamil Nadu's Pudukkottai district. Police are looking into the matter. Chennai: A statue of E. V. Ramasamy who is also known as Periyar, near Aranthangi in Tamil Nadu’s Pudukkottai district, was found vandalised on Monday. Police have launched a probe into the matter. In an earlier incident, On the occasion of Dravidian icon E V Ramasamy’s 139th birth anniversary, a man hurled a shoe at the rationalist’s statue in Chennai. Police said they were on the lookout for the miscreants who vandalised Periyar’s statue at Dharapuram in Tirupur district, while the accused in Chennai was overpowered and arrested. The ruling AIADMK, the main opposition DMK, its parent outfit DK and other political parties condemned the incidents. AIADMK leader and Fisheries Minister D Jayakumar said, “Amma’s (late Jayalalithaa) government will not tolerate such unacceptable acts. They (the culprits) will be brought to book. Stern action will be taken against them.” DMK chief M K Stalin demanded that those responsible for the incidents be booked under the National Security Act.